The design is based on the discovery that convex surfaces may be created by straight lines wrapping around a frame of curved edges. The design relies heavily on density variation: geometry and color are combined to capture and captivate the unsuspecting audience. Simultaneously, the structure is dynamic, controlled by tension forces generated by pulleys anchored around the gallery space walls. 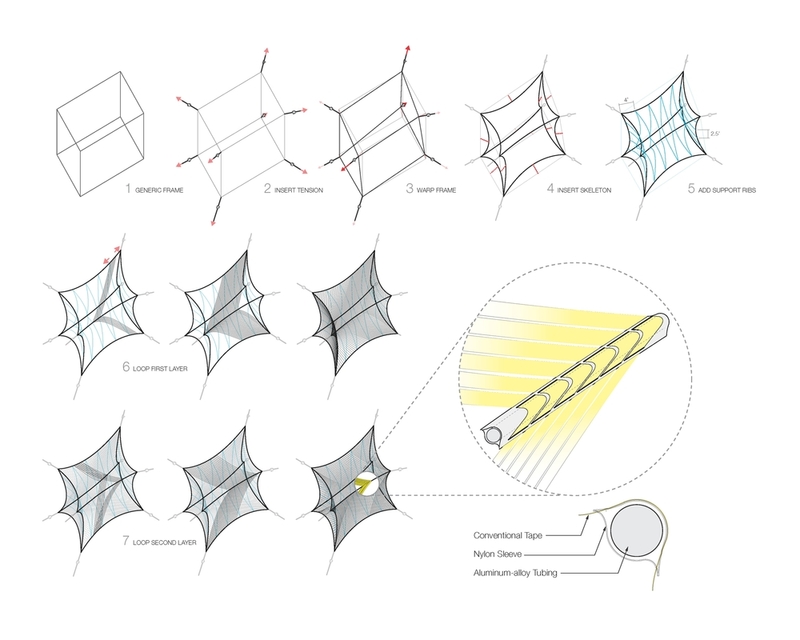 While the porosity of the proposed material system would not contain sound within it, the sound would behave based on the geometry of the host space. Opportunistically, the geometry creates new zones within the host gallery space that are defined between the surfaces of concave curvature and the orthogonal gallery walls. The color and material gradient consisting of a lively yellow, a light gray and a contrasting black bring energy to the naked space of the Hyde Park Gallery. Hammock Prism is informed by Pier Luigi Nervi's drawings for his Airplane Hangars, particularly the idea of crossing arcs that optimize the shell thickness.